This holiday home is part of a unique building, which includes another three holiday residences. The enormous estate contains a large, enclosed, and shared swimming pool with a partially covered terrace. A great spot to enjoy some peace and quiet on your sun lounger. 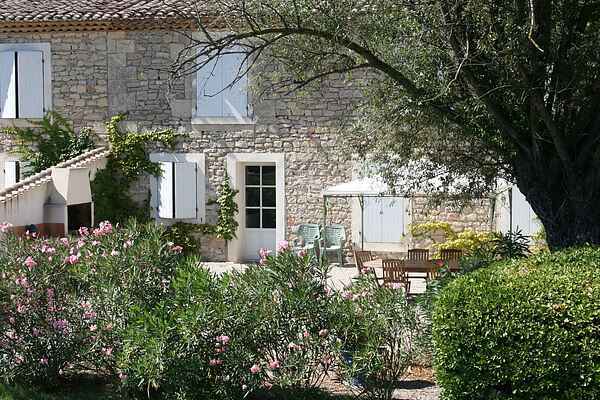 The house has an enclosed, private garden with a private terrace, furniture and a stone barbecue. Here you'll have plenty of privacy. If we look at the interior of the house, we see a well cared for, pleasant interior, decorated in (burgundy) red. All amenities are supplied to make sure your holiday is perfect, indoors and out. St. Laurent-d'Aigouze is a little village in the middle of the gorgeous Camargue, an area where daily life is still influenced by tradition. A visit to the surrounding attractions such as the medieval town of Aigues-Mortes (8 km), the towns of Montpellier (30 km) and Nîmes (30 km), and the Cevennes are highly suggested. Or perhaps the old port of Le Grau-du-Roi and the aquarium of Port Camargue, where you can admire more than 300 types of fish. There are, of course, the well-known beach towns of La Grande-Motte (10 km) and Saintes-Maries-de-la-Mer (20 km).